That’s why, in a way, I “cheat” by setting parts of my stories here on Earth. (That’s true of the first two of my Interstellar Rescue series, at least. The third book, Fools Rush In, is set entirely in space.) It helps me as a writer, but I think it also helps the reader relate to the story. If some of the places are familiar, then a reader new to SFR might have an easier time accepting the introduction of more alien places and ideas. That's quite a few, eh? Think about what Donna wrote in her post, and then consider this question: What in that list of tropes has anything to do with science fiction worldbuilding? If you answer nothing, then you're absolutely right. 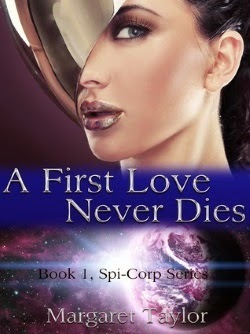 Going on tropes alone, A FIRST LOVE NEVER DIES would work perfectly well in a contemporary setting. So my second question is this: are readers reading this book primarily for the worldbuilding, or the tropes? I ask because with this blurb, the tropes are being broadcast loud and clear. (Caveat: I've not read the book so for all I know, the blurb may accurately reflect the story, or it may not.). Question from a marketing/visibility/appeal angle: Do some SFR authors worry too much about worldbuilding when the real draw for some readers (maybe even a large group of readers) might be the tropes? Ultimately, romance tropes and SF settings work well together--very well more often than not. That said, the more immersive/"authentic" the worldbuilding and science fictional themes, the more likely an SFR story offers something distinctively different from other romance subgenres (e.g., cyborg characters; android romances. For a good example of those read Catherine Asaro's SUNRISE ALLEY and ALPHA.). Now you tell me--what's your take on the role that romance tropes play in SFR? To what extent do tropes impact your choice of books in this genre?